It is common to hear metal fans and musicians talk about the “metal community.” This concept, which is widely used when referencing metal music, encompasses multiple levels of complexity that are seldom addressed in academic endeavors. When examined in detail, it raises more questions than answers, as Blabbermouth.net reports. What criteria are used to define groups of people as a community? How does the concept of community vary or remains the same across cultures? How do different academic disciplines define the communal experience in metal music? In light of the importance of individualism in metal music, are communities even possible? These are just some of the questions that arise when the concept of “community” is used in relation to heavy metal music. A group of 10 academic researchers on heavy metal music will meet to discuss these issues. 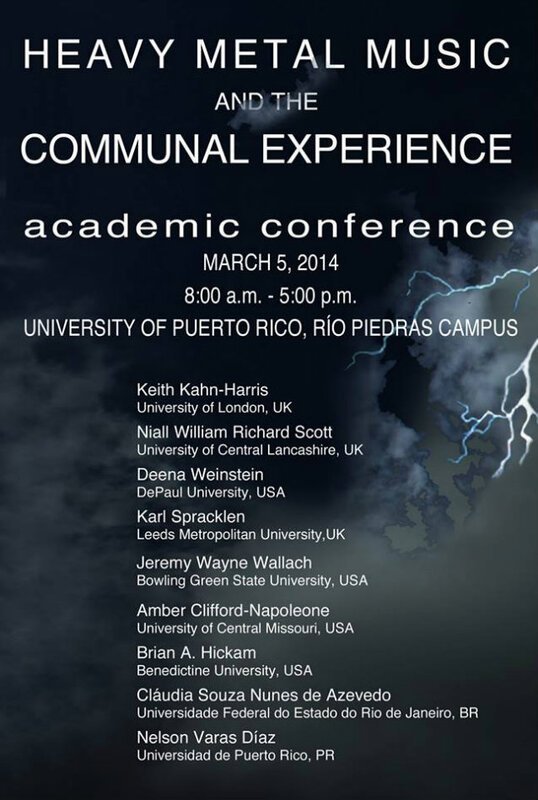 Presentations from scholars from Europe, Latin America and the United States will take place on March 5, 2014 at the University of Puerto Rico. A video message from Dr. Niall Scott, Chair for the International Society for Metal Music Studies, can be seen below.